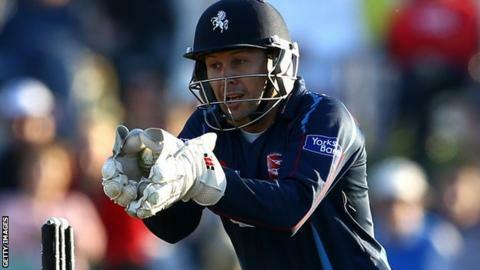 Former England wicketkeeper Geraint Jones says he is ready for his career finale at Lord's on Saturday when he plays his final game before retirement. Jones, 39, will lead Gloucestershire out against Surrey in the One-Day Cup final. "To think this will be my last professional game in England, I must admit, I'm ready for it," Jones told BBC Radio Bristol. "The fact it is a final at Lord's, is helping with that." Jones, who was part of England's 2005 Ashes-winning side, says he is determined to end his career with a trophy for Gloucestershire - who he joined this year after more than 10 seasons at Kent. His last domestic final was the Friends Provident Trophy final in 2008 when Kent were beaten by Essex, and he says the team are desperate to end the campaign with some silverware. "When I spoke to Richard Dawson mid-season and said my plans and thoughts of retirement I would never have thought there was a chance of doing it this way," he added. "I'm going to make sure I enjoy it on Saturday. "I'm not going to do any big Churchillian speech, because I don't need to. These lads grew up on a diet of watching Gloucester in One-Day finals at Lord's so they know the importance and meaning." Jones admitted Saturday will be an emotional day for him and his family. "I could be a blubbering mess," he said. "My family will be there, my two boys are coming up on the train to London. "It will be a nice little honour but ultimately the day is not about me, it is about Gloucester, and I want to walk off that field lifting the trophy together."